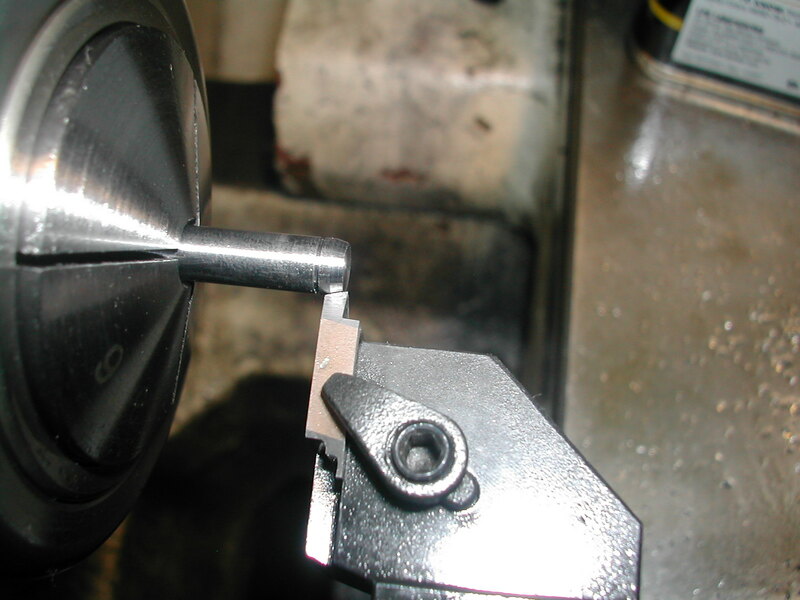 Finally, a nice simple part if you ignore the 0.018″ snap ring grooves. I started with some 12L14 unhardened precision ground shafting from McMaster-Carr. This shafting, p/n 1327k52, has a diametrical tolerance of +0.0000″ to -0.0002″ with a 10rms surface finish. 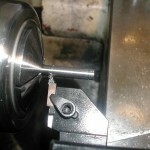 With the stock in 3/16″ collet, I’m using my parting tool as a stop. I’ve preset all of my tools in the DRO on my lathe so each cutting operation on the part is assigned a different “zero”. I most cases having these preset on the DRO means that I don’t need to remember dimensions, I just crank until the DRO readouts show 0.000 for X and Y. 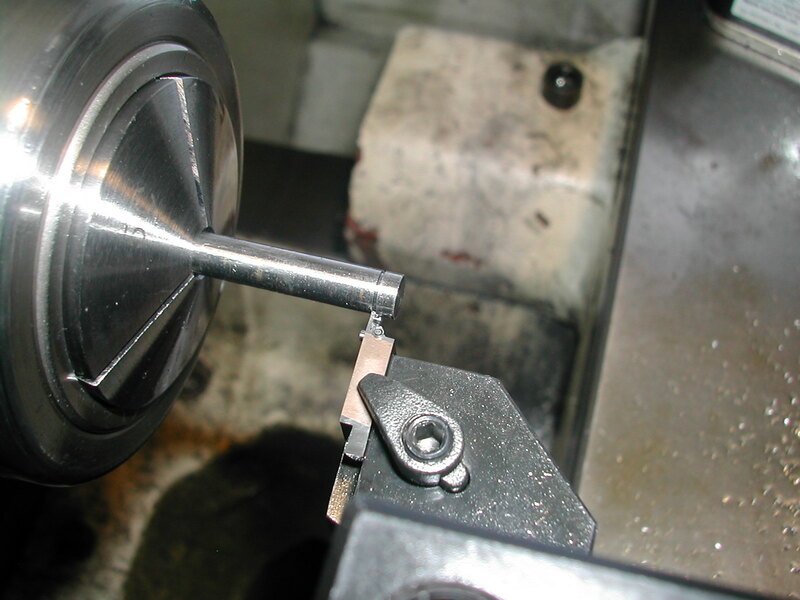 In this case, this is Zero #1, and my tool is at +0.020″ in Y. 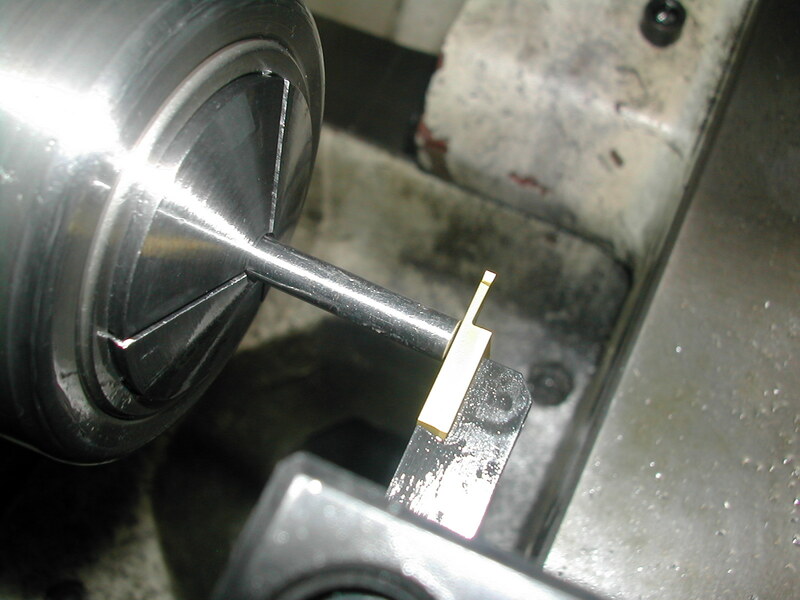 Still with Zero #1, I’m moved Y to 0.000″ and I’m facing the end of the pin. 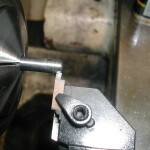 I have flood coolant on the lathe, but I rarely use it. Most of the time on these small parts, I just using a couple of drops of LPS Tapmagic (either #1 or #2 depending on the material). 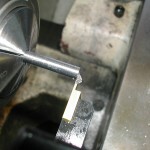 With tool #2, I’m cutting the first snap ring groove. 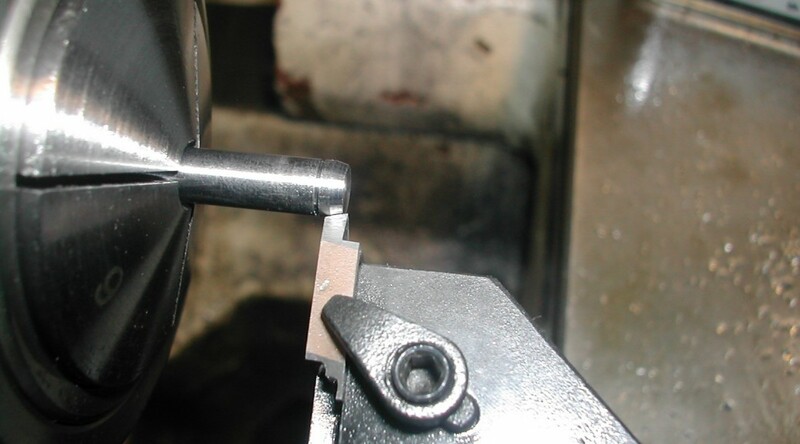 My zeros are set so that the first groove is located at 0.000″ in Y and I feed to 0.000″ in X. The fewer numbers I have to remember, the fewer chances for mistakes. 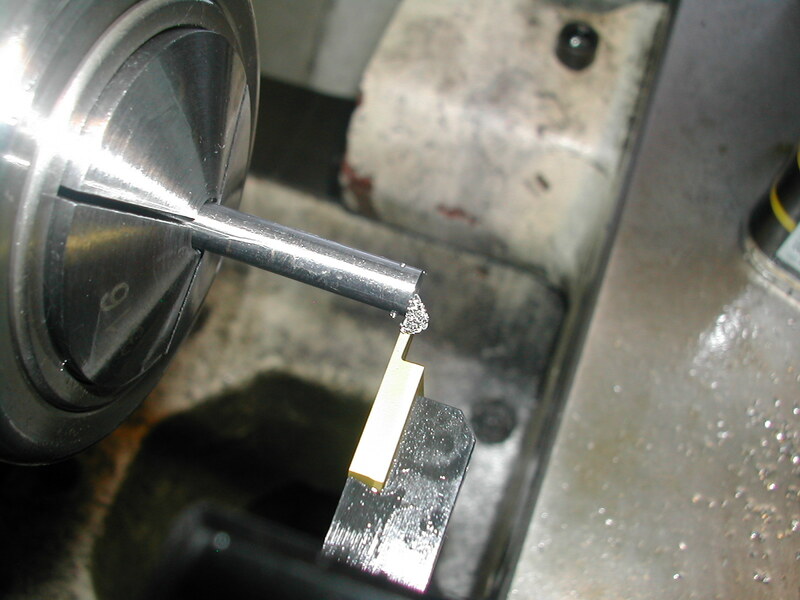 Tool #2 is moved in Y to cut the second groove, but I’m still feeding X to 0.000″. 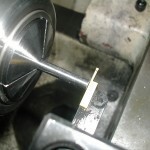 Back to the first tool to part the pin off from the stock. 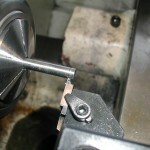 The above steps are repeated to make the full compliment of slave rod pins. 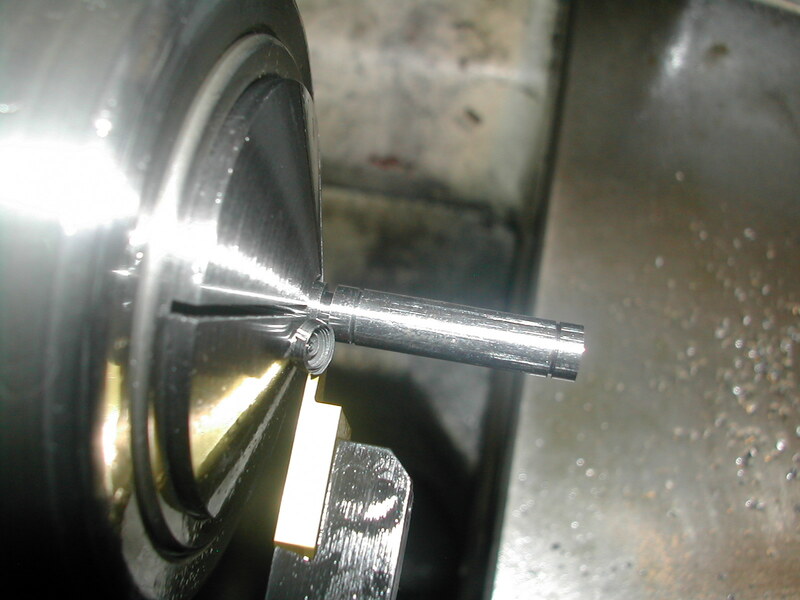 Once all of the pins have been parted off from the stock, I set up the 3/16″ collet with a collet stop. 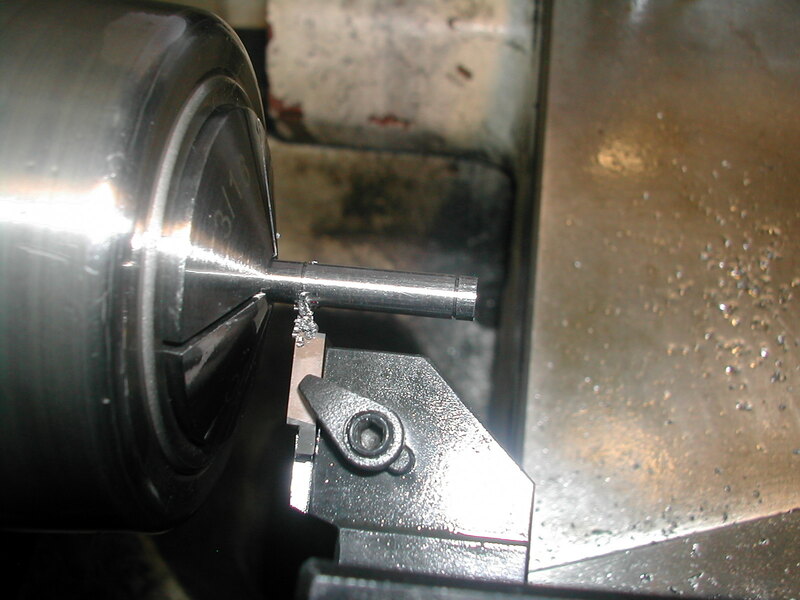 Each end of the pins is chamfered, and hit lightly with a 600 grit abrasive file to knock any burrs of around the chamfer and the snap ring groove.